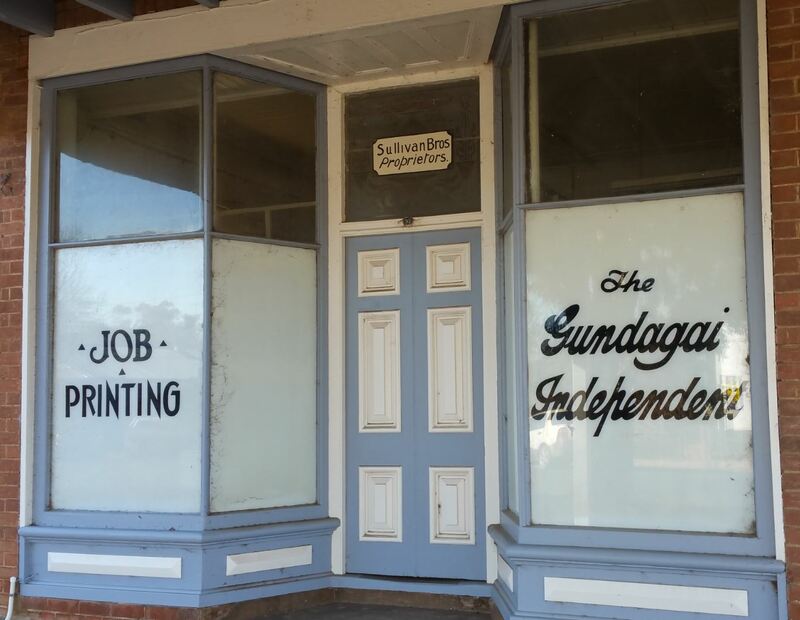 But there was much more than football on the minds of Gundagai people…. The road to recovery from the horrors of the war was rocky. Soldier settlers were heralded at Tarrabandra, Bongolong and elsewhere in the Shire but many struggled to repay their loans. Some were new to farming, others suffered from their wounds and persistent trauma. The bigger graziers feared the spectre of Bolshevism and in May met at the Royal Hotel to prepare for the probable shearer’s strike. The continuing civil war in Ireland weighed on the minds of many local Hibernians. The Gundagai Times greeted the year by declaring that “the spirit of revolt has grown to extraordinary heights”, witnesses by trade union strikes, disruption of interstate shipping, general neglect of religious observances, and men now being more loyal to their union than their community. The working man had been promised a brighter future following his efforts fighting the war and it was not being delivered to the satisfaction of most. Unemployment was rising. Men wandered in and out of country towns looking for work. The 44 hour week was a key demand. Tensions arose in Gundagai, as everywhere, around the question of whether repatriated soldiers should be given preference in employment. When leftists burned the Union Jack in the Sydney Domain on May Day 1921 many were outraged, no more than former soldiers. Meanwhile shearers demanded a new wage deal that others could only dream of. Around the Murrumbidgee a poor man could always eek out of living rabbiting – in April the freezing works was receiving some 1,800 a day. But work for many was seasonal and precarious, and the safety-net minimal. Advertisements for motor cars started to appear in some newspapers. They were considered hazardous and ornery beasts that only the wealthiest grazier or merchant could afford. When a big Tumut crowd came up for the Maher Cup match on 21 September the sight of 20 cars in Sheridan Street was deemed a phenomenon worth reporting. Life for most people was still about horses, sulkies and trains. The mail train from Sydney arrived at 9.02am daily and then ran to Tumut 20 minutes later. The train to the big smoke departed at 3.55 pm. The second class fare was £1/18/4, the basic wage just over £4. If you took home £7 you were very well off. Bread was 6d a loaf, butter 2/9 per lb. A phone call to Sydney cost 3/4 for three minutes and 6d to Tumut. Letters cost 2d, telegrams of less than 16 words 1/-. Rabbit skins could be sold for 6d. Wirth’s Circus charged 3/- to 6/-, boxing was up to 5/-, the Maher Cup 1/- with women and children free. A house in town could be purchased for somewhere between £500 to £900. There were six hotels north of the river flats (Royal, Club House, Criterion, Family, Railway and Great Southern) and two over in South Gundagai (Bridge and Star). 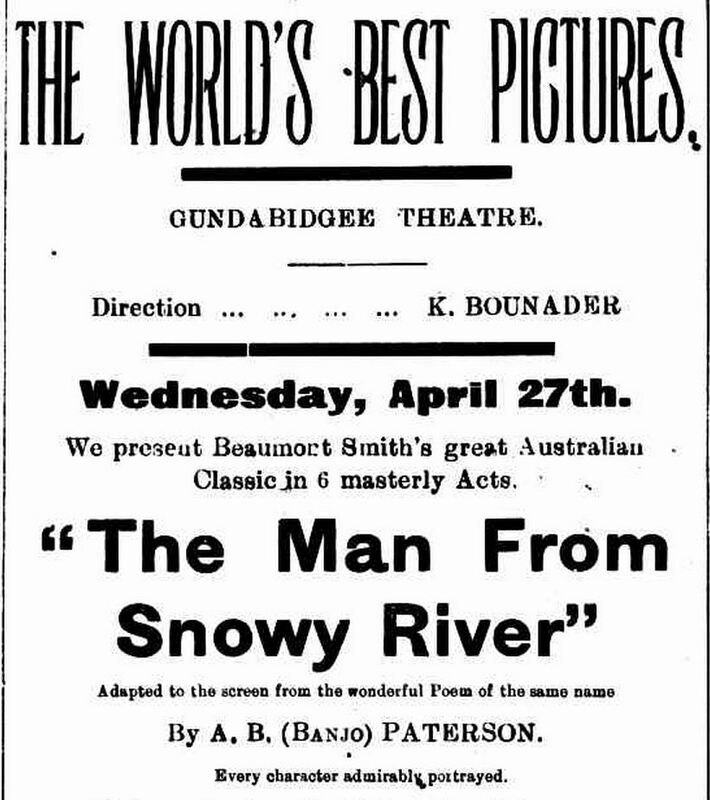 Movies, meetings, boxing, and concerts were held at Bounader’s Gundabidgee Theatre. The government medical officer Doctor Gabriel photographed the town, Nurse Murray had her private hospital, D.P. Turner the dentist was also president of the football club, hardware and manchester merchant Stribley was the mayor, and newspaper proprietors Sullivan and Elworthy were also magistrates. Public bodies included the Hospital Board, the Literary Institute, the Red Cross Society, the Race Club, the Citizens’ Sports Club, the Football Club, the P&A Society, Parents & Citizens, Repatriation Committee, the Town Band, the Tennis Club, the Rifle Club, the Pastures Protection Board, the Local Land Board, the Stockowner’s Defence Association, National League, Labor League and Empire League. There was land hunger, demands for more soldier settlements, complaints about loans and land valuation, worry about debts, uncertainty in wildly fluctuating markets, whether to plant maize or wheat, run sheep, cattle, or pigs, dairy or beef. Many farmers had Labour sympathies, but those who didn’t mostly broke from the Nationals and supported the new County Party. Labour was running the State and Billy Hughes the Nation, but neither seemed to be doing the job required. Mining was in decline although new leads at the Long Tunnel Mine and at Sandy Falls spread optimism. Long Tunnel even had their own cricket team. Upstream the Burrinjuck Dam construction was well underway. In January discord followed the new law requiring all firearms to be licensed and restricted to those who had attained the age of 16. In February the big race day made £256. In March the agricultural show, renamed the ‘Repatriation Show”, took £114. The best Maher Cup gate for the year was reported at about £15. The circus animals came to town on a special train, as did Cootamundra folk coming down on Show Day. The occasional Avro airplane would fly in, land in a paddock, and excite young and old. On Empire Day and into cracker night the kids played up and took over the town. Later in the year a mob of 900 bullocks caught the public eye as they paraded down Sheridan Street and over the bridge on their way from Goulburn to Finley. 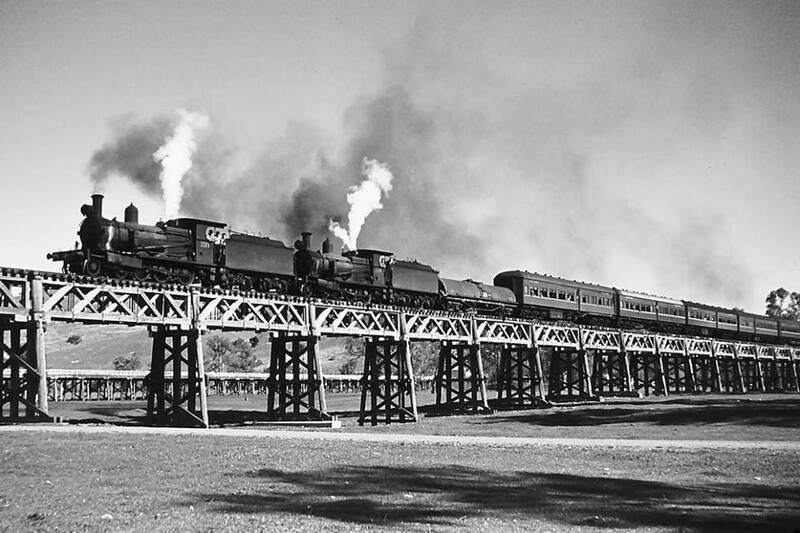 Just before Christmas locals were outnumbered by visitors, when railway workers and their families came by special trains, from all over the southwest – as far away as Lake Cargelligo and Griffith – for their picnic day by the Murrumbidgee. The football season waited for winter to start. The decision to play League was made on 5 May with the season to commence on Sunday 21st. Council approved Sunday football without controversy. The local competition comprised only four teams – Coolac, Nangus, Jugiong and Gundagai – and ran for just two months. The Gundagai and South Gundagai Wanderer clubs entered a combined team but still couldn’t defeat Jugiong in the final before 1,000 folk at Anzac Park. It was only in August that attention turned to the Maher Cup. 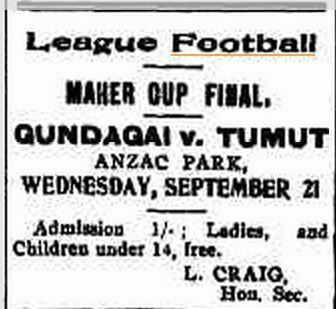 Although the visit by a team from Mascot raised more excitement, on 17 August 1921 Gundagai defeated Tumut and became the first team to celebrate bringing the Cup home. The boys brought the Cup home to Gundagai, and Host Hogan filled it with champagne, and they made speeches, and talked of challenging the Springboks and going on an English tour. It was a great night! Five weeks later Gundagai made its first defence, successfully. Tumut cried foul over the hometown referee engendering the spite that was to become such an essential part of the Maher Cup story. 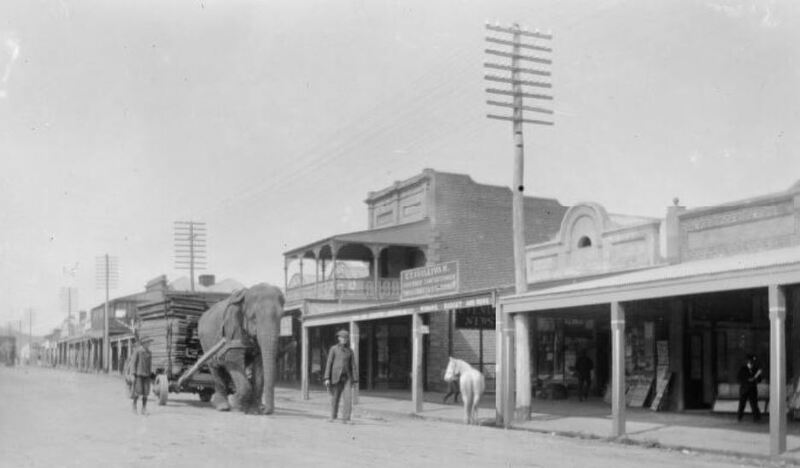 However it was none of the above that really captured the imagination of Gundagai folk in 1921. 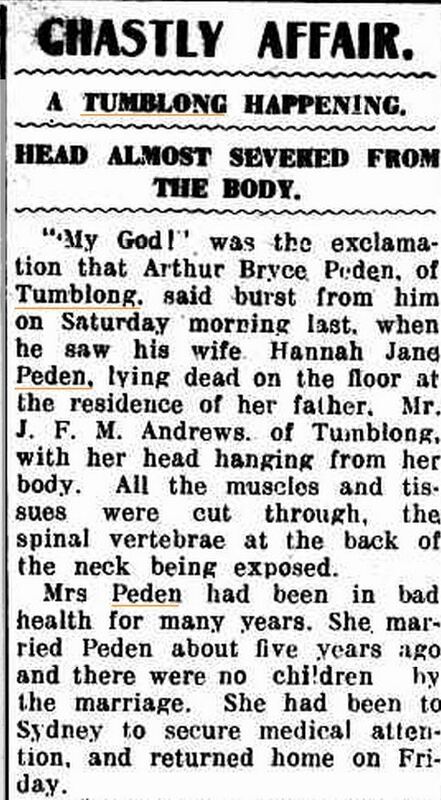 What did was the body of Hannah Jane Peden. Mrs Peden was found dead on the floor of her bedroom at Tumblong with deep lacerations from ear to ear and her head almost severed. While she had a history of mental illness and frequently declared the intention to kill herself, it didn’t seem possible to most folk that for such a violent and gruesome act could be self-administered. Her husband Arthur, who had fallen out with his in-laws, with whom the couple resided, was tried and sentenced to be hanged. 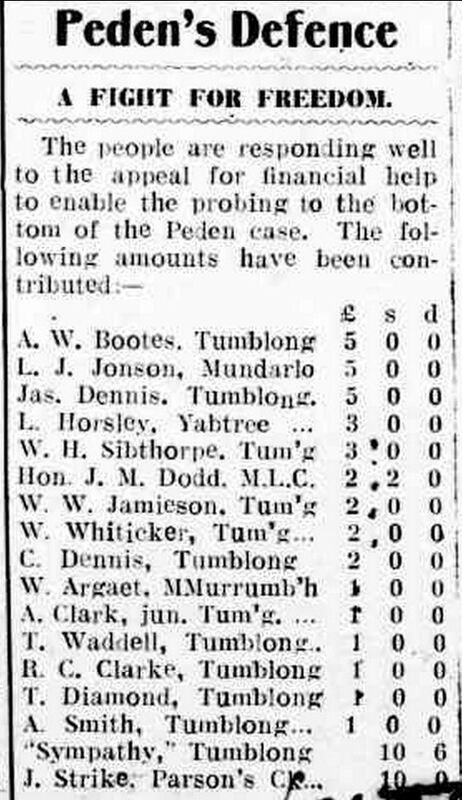 Many people in the Gundagai area of course knew Arthur Peden and were convinced of his innocence. Pat Sullivan of The Gundagai Independent worked hard to raise funds for Peden’s appeal – raising almost £100 from scores of local donors. It took until the following year through an inquest, two trials, an appeal, a public campaign, and a Royal Commission before Peden was exonerated. A book was later penned on the case and a television play broadcast. This ‘who-done-it’ has never been resolved. The following year Cootamundra challenged for the Maher Cup and with a team oozing with talent and brimming with fitness took the focus away from the original towns – Gundagai and Tumut. This entry was posted in Places and tagged Gundagai. Bookmark the permalink. Have just discovered this site and have found it extremely interesting and chock-a-block full of info. Congratulations to Neil Pollack on compiling this site. Not that I have a great interest in football, but I am very interested in the early history of Gundagai. In a book published in 2002 – “Gundagai; A Track Winding Back” by Cliff Butcher (ISBN 095862000-0-8) is a photo on page 257 of spectators escaping from a flooded Anzac Park at Gundagai after a Maher Cup match on 7 June, 1952. The floodwaters were rising fast during the match but none of the fanatical spectators wanted to leave until the match was over! By that time the ground was well and truly flooded and the only escape was on the back of trucks. 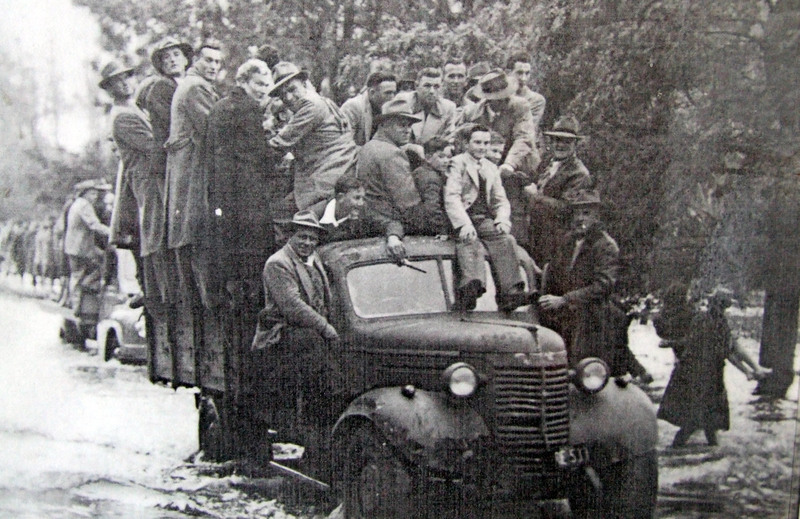 The photo shows the McCabes Cordial Factory truck driven by my father, Jack Jones, with dozens of people clinging on to every available space on the truck! Neil, have you heard of this escape from the floodwaters before? I don’t know if you are interested in this story, as it does not relate to the Maher Cup, or even Rugby League, but I have a photo of my father in a Gundagai Rugby Union team of 1909. My father was a very fast athlete (He ran in the Stawell Gift). He played as centre three quarter in the Gundagai team. My father had the nickname “Slippy” Jones, as apparently he was that fast, he really slipped along!!! He worked at McCabes Cordials from age 13 years, until he died in 1962 aged 76 years. He owned the factory for much of that time. The photo was presented to Agnes Tracey the landlady of the Club House Hotel, Gundagai (later the Gresham Hotel). She was my great-aunt. Aunt Tracey was a great supporter of sporting teams in Gundagai. Most of the players in this 1909 football photo are not recognisable as ancestors of present Gundagai families. The only three people who presently have descendents in Gundagai (that I know of) is George Goodsall, one of the officials, grandfather of Pam Goodsall, Jim Vaughan, another official, great-uncle of Marlene Reichel and Jack Smith, who was the grandfather of the present Mayor of Gundagai, Abb McAlister. I was very taken with Peter Castrission’s reminiscences about his father and uncle’s involvement in football in Gundagai. I knew Peter’s three older sisters, Pat, Nita and Joy. regards, Marcia. Hi Marcia. Thanks very much for the information. I would love a photo of the 1909 Rugby Union team. Maybe you could add it to the facebook page? – ‘Maher Cup Country”. I do have a photo of the trucks in the flood of 1952. http://mahercup.com.au/wp-content/uploads/2014/04/floodwaters1952.jpg Is that the McCabe’s truck in front. I heard that Mr Ballard the skin buyer also used his truck. I haven’t written about the flood match because it has been well covered elsewhere. In fact the newspapers were so preoccupied wit hthe flood that it is hard to find a report of the actual game that day. Thank got for Pat and Jim Sullivan of the Gundagai Independent who did bother to report on the game.